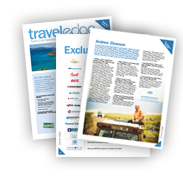 Discover the most exciting travel opportunities available today. We’re proud to bring you this one-of-a-kind travel club! We've tapped into our long-standing relationships with top travel companies to bring you the world's best travel deals available today. On top of great travel savings, you'll also receive highly personalized service. Unlike other Travel Clubs, you will not speak to an unknown voice through an 800 number or send money to a P.O. box. As a member of the “Club”, you'll be referred to a local travel agent who will personally answer your questions. All to ensure that you have the best possible vacation experience each time you set out on a new journey. Begin one of the greatest travel adventures of your life.